Just when you thought you'd seen all the luxury property that Myrtle Beach has to offer, we show you the Waterway condominiums in Lauderdale Bay. Their name is not accidental, and they are every bit as impressive as any condos in Fort Lauderdale. Located off Hwy 17 South between Harrelson Blvd and Market Common, Lauderdale Bay is convenient to everything from Broadway at the Beach, Coastal Square Mall, and of course, Market Common. This is a sprawling gated community, with oversized luxury condos of three and four bedrooms. The project was completed in 2008 and offers square footage from 1750-1800 sq ft to 2350-2450 sq ft. Prices range from about $300,000 to $450,000 and up. Amenities are amazing. A beautiful large pool, views and a private dock with boat lift on the Intracoastal Waterway. Some units include an optional boat slip or they can be purchased. The Arrowhead Golf Course is across the water, and some units have a gorgeous view of the greens as well. The units have enclosed balconies, and you'll enjoy under building parking with elevators. Condominiums have every upgrade from hardwood floors to crown molding and fireplaces. Perfect for vacation or permanent residence, children will attend Myrtle Beach Elementary, Middle, and High Schools. 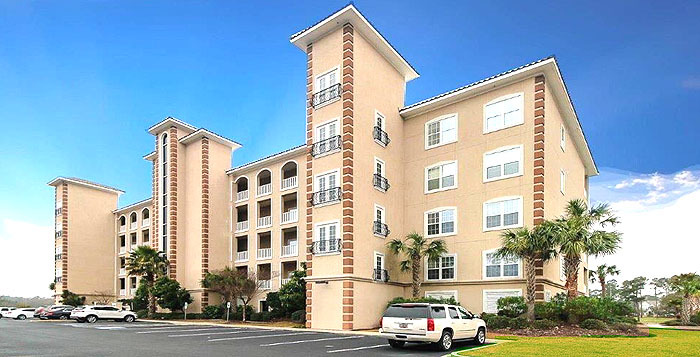 If you are looking for the finest luxury condos in Myrtle Beach, don't overlook Lauderdale Bay. There are several exquisite units available and we'd love to show them to you! Call us today.